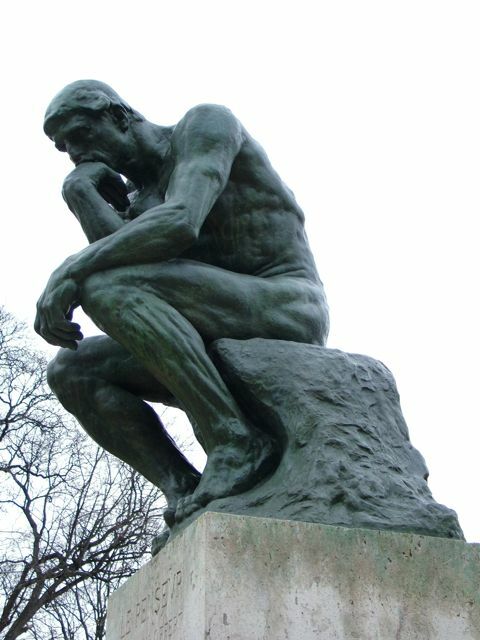 Day three in Paris: Firstly we visited the Musée Rodin, a museum dedicated to the French sculptor Auguste Rodin, probably most famous for his sculpture “The Thinker”. Here we enjoyed a great display of his works. I think I surprised myself that sculpture could be as interesting and engaging as paintings or music. If you ever get the chance, I can recommend spending a good bit of time with “The Burghers of Calais”, “The Gates of Hell”, and “Balzac”. "I wonder if I should have worn a singlet." Next we decided to have a crack at the Eiffel Tower. 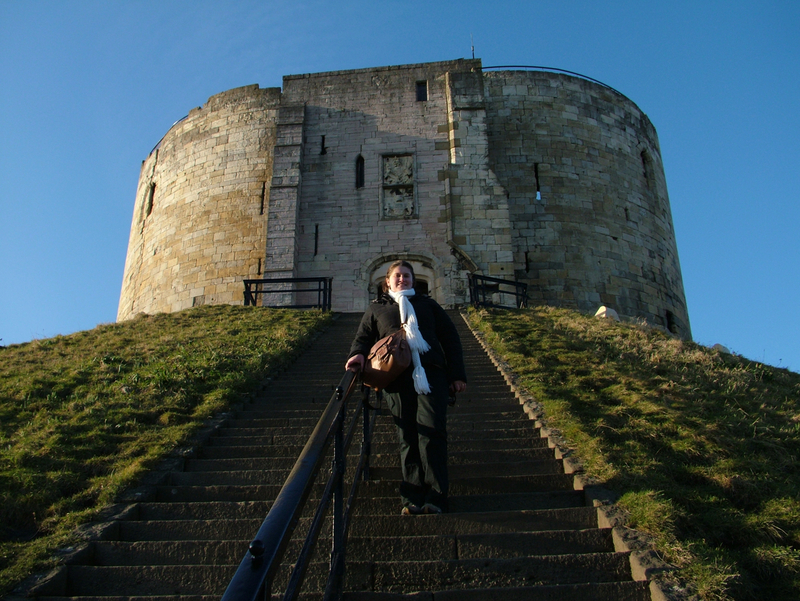 You can access the tower by one of four entries housed in each of the tower’s four feet. 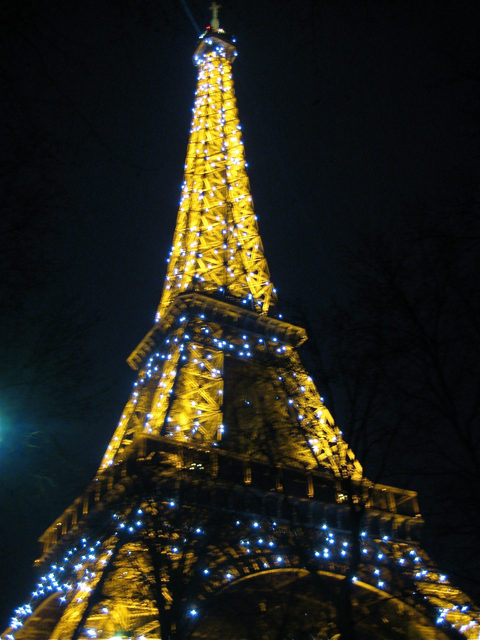 When we arrived, two of the feet were closed and half the population of Paris had formed a queue outside the third foot – I was to discover that this was the entry for those wishing to climb the tower by elevator. Not wishing to stand in line for the rest of our holiday, we joined the much shorter queue of people willing to climb to the first and second levels (115 metres above ground level) using the stairs. Three years of living in a second floor apartment obviously placed us in good form for the first 28 steps, some of the remaining 682 were a bit of a struggle though. Eventually, thanks also to the compulsory elevator between the second and third levels, we found ourselves 276 metres above the ground looking out at a fairly decent view of Paris. 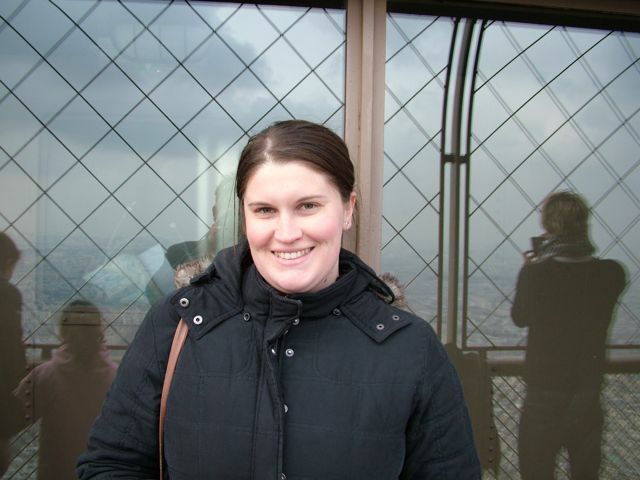 A slightly anxious Anna atop the Eiffel Tower. Finally we headed off to the Louvre Museum for an evening visit. This was a fascinating experience. 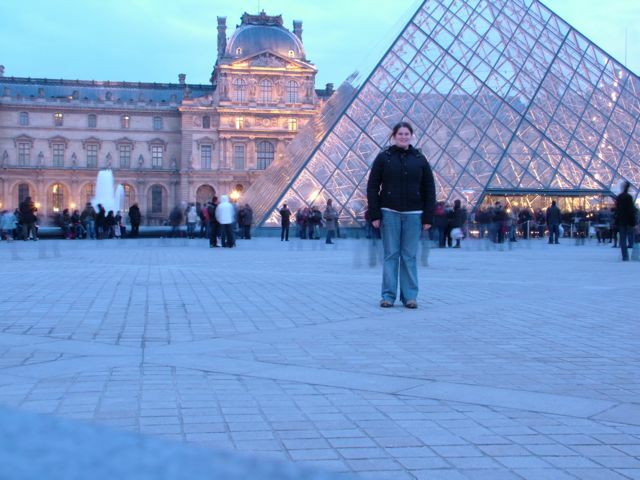 The Louvre is jammed full of all sorts of paintings, sculptures and artifacts. 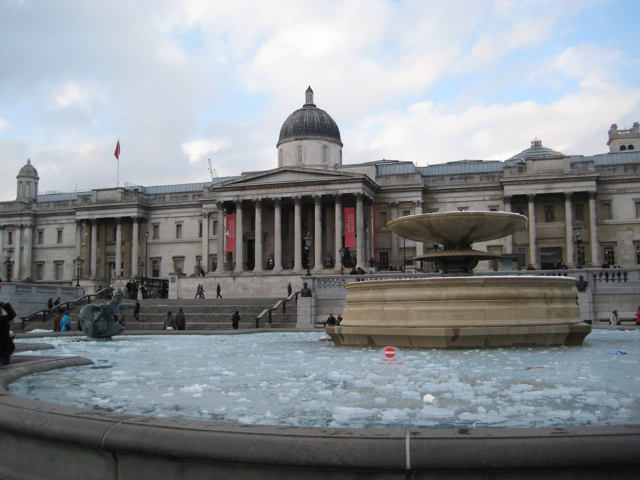 The Mona Lisa – It was interesting to actually see this work in the flesh, so to speak. Can I make a startling confession? I wasn’t really that impressed with it. Firstly, it is quite hard to appreciate properly; the whole painting is quite small, only the size of a small movie poster, and there’s a barrier of about 10 metres in front of it, stopping people getting too close. Then there’s a thick pane of glass in front of it, which manages to reflect all the lights in the well-lit room across the picture. I finally muscled through the crowd, weaved around until I found an angle where I could see the picture properly, and had a good look at the picture. But try as I might, I could not see why this painting warranted such fuss. Now clearly I don’t know much about art, but usually with a good deal of explanation and research I can come to appreciate great works that I didn’t initially understand. Not the case with the ML. I can see how it’s interesting, technically perfect and perhaps innovative for a portrait of its time, but take all the hype away and I’m not sure I would rate it as the most moving or interesting artwork I saw today. 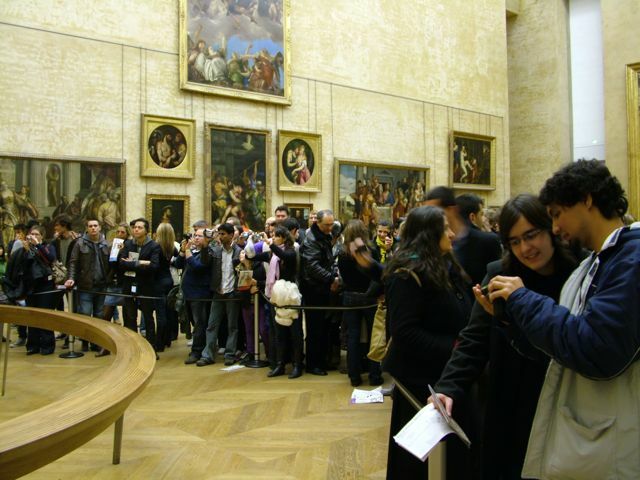 The crowd admiring the Mona Lisa. 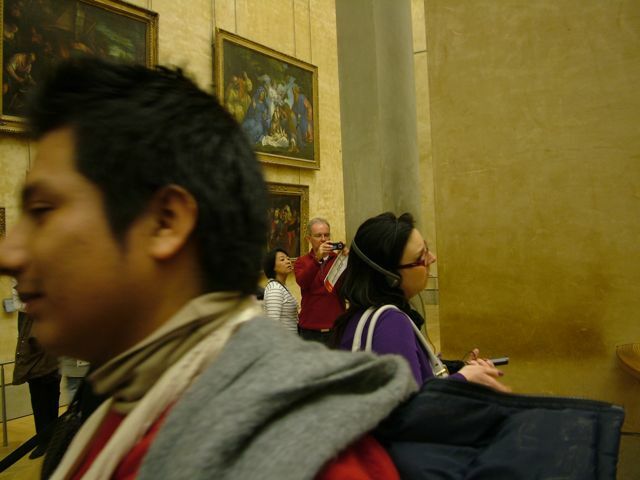 The man in red taking a picture of the crowd admiring the Mona Lisa. 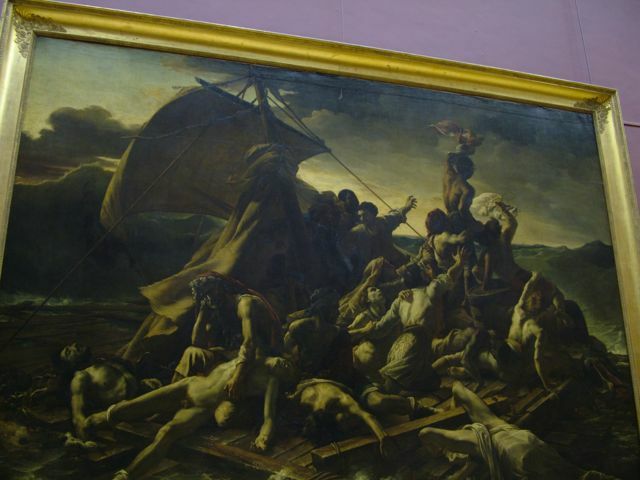 The Raft of the Medusa – This was my favourite painting in the Louvre. I sat in front of this painting for a good while. The composition is just plain interesting with its pyramid shapes and various diagonals. The picture tells a story of tragedy, turmoil and hope. Plus it’s huge. All in all, not a bad evening although after tramping around the Rodin museum, up the Eiffel Tower and all over the Louvre, my feet were killing me and I was glad to head home. 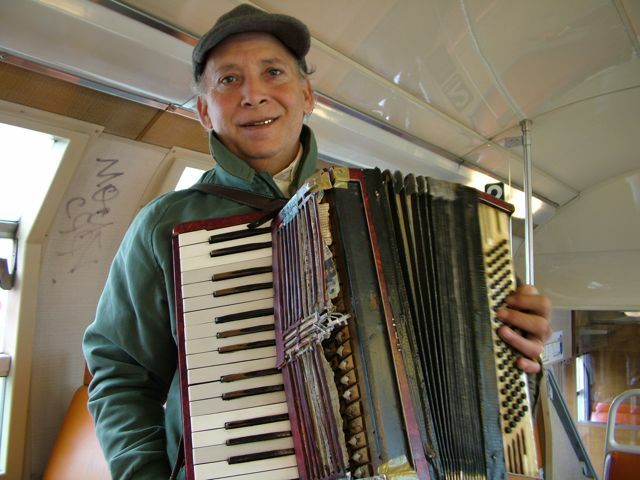 There always seemed to be buskers on the trains. The next day we caught the train out to Versailles to check out the palace there. 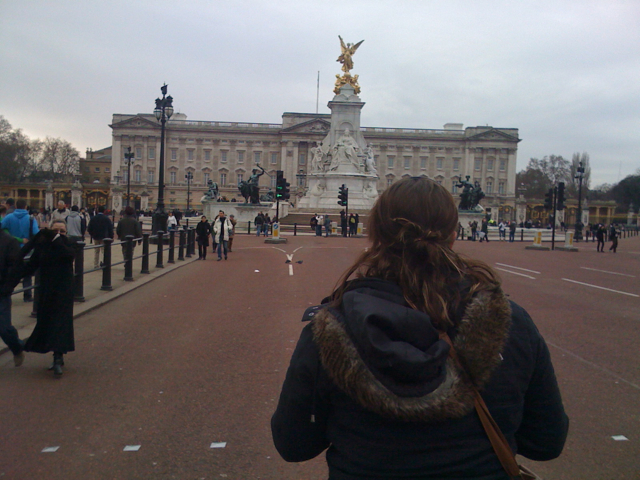 The palace was around for a fair while, but the monarch who did the most work on it was Louis XIV. The rooms were incredibly decorated with colourful walls, painted ceilings and no shortage of artworks. We were able to see almost all parts of the palace including the king’s apartment and bed chamber, the queen’s apartment, the princes’ wing, the hall of mirrors, the chapel and the remarkable gardens. Not a bad day, but a lot of walking and after the work out our feet got yesterday we were quite worn out by the time we were back on the train. 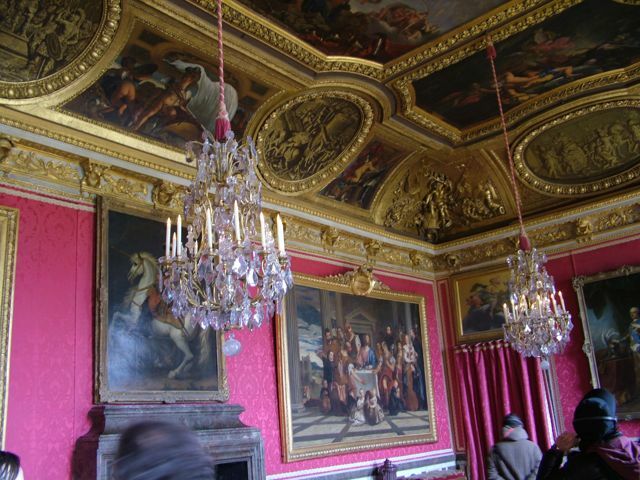 A room in the palace at Versaille. They sure know how to decorate. 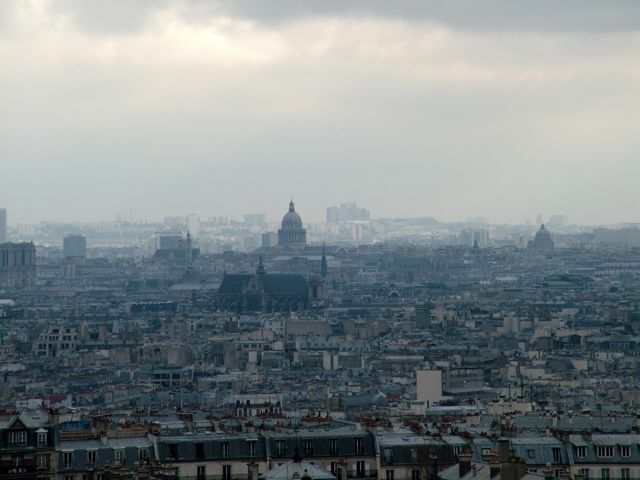 The following day, on the recommendation of Dan, we went to see the Sacré-Cœur area, a region on a hill in Paris based around the Basilique du Sacré-Cœur (“Basilica of the Sacred Heart”). On the walk up to the church we passed plenty of interesting tourist shops and cafes. We hadn’t had breakfast at that point so we grabbed a couple of chocolate and banana crepes to go – keeping things healthy as always. We polished these off as we walked up the fairly steep climb to the church, passing buskers, beggars and people selling Eiffel Tower key chains (who were presumably lost). The church was an impressive building built on the very top of the hill so that from the front doors of the church you got an amazing view of the city. Inside a pipe organ was playing something very fast and spooky in a minor key that made you feel like the phantom of the opera was about to jump out at you at any moment. Like the Notre-Dame cathedral, the Basilica was jammed full of tourists and I did feel a little embarrassed to be one of them, for the sake of the few clergy and worshippers, still using the building as it has been used for hundreds of years. Next we moved around to the Palace Tertre, a square full of artists with their artworks. 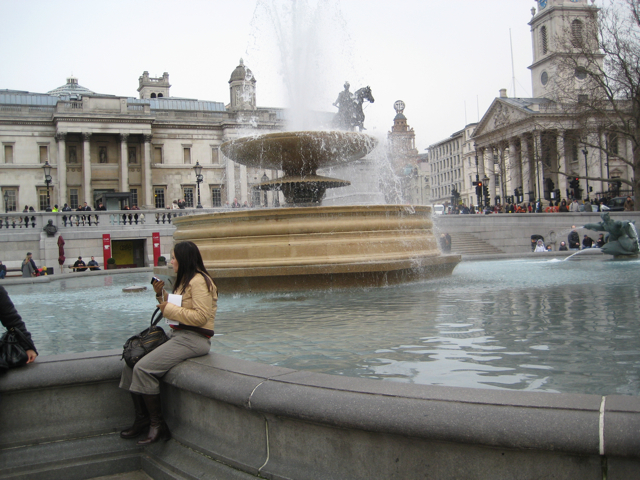 The lower half of the square was full of artists who would paint or sketch portraits or caricatures of customers. The upper half of the square was full of artists who were selling their own artworks of landscapes, cityscapes and so forth. I saw a fantastic pair of portraits of jazz musicians, painted with cool smooth colours and textures that made the paintings “look” like the music would sound. They were 1500 Euro each, so we decided to pass (plus they would have been a nuisance to get home on the plane). 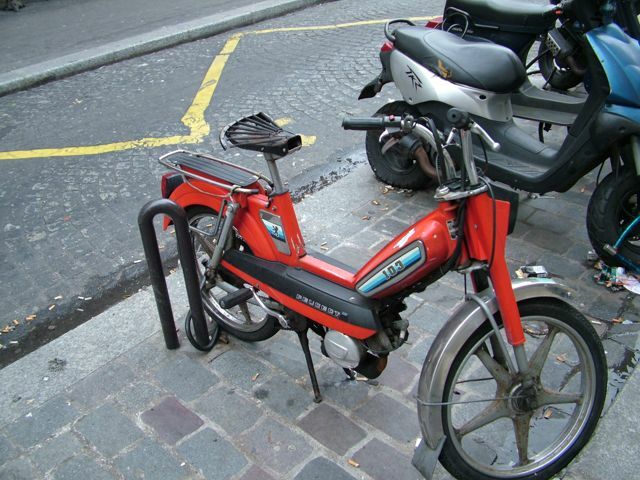 We saw scooters and motorbikes everywhere, but this Peugeot 103 Moped was one of my favourites. We walked around some more, checking out the other galleries and gift shops and stopped for lunch at a nice pizza restaurant/piano bar. Next we wondered down and saw the Moulin Rougue. Finally we walked back up to the artists’ square and after much deliberation, we bought a nice small painting of some flowers in a field. Anna dances in front of the Moulin Rouge. On our way back to the station, on the steps of the Basilica, a busker with a guitar and microphone had managed to attract a fair crowd. He was playing great pop songs in English, Spanish and Italian and had the crowd clapping and singing along. 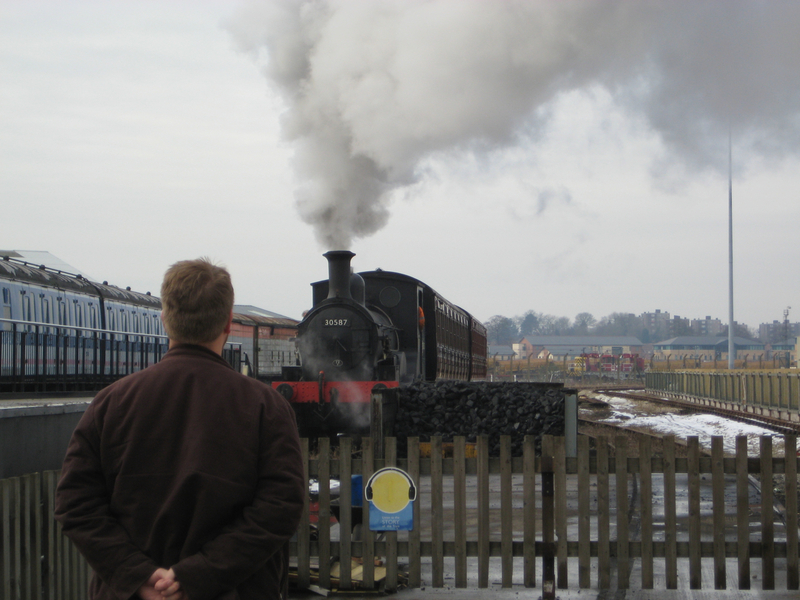 We watched him for a while and then wound our way back to the station. 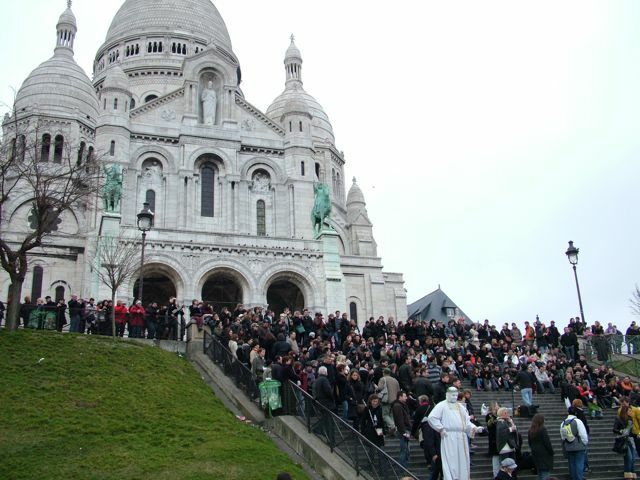 A busker holds the crowd captive on the steps of the Sacré-Cœur. For dinner we had hoped to go back to the supermarket and grab some bread and cheese, but inexplicably the supermarket was closed (it being about 9pm on a Sunday evening). Much to Anna’s chagrin, we decided to grab dinner instead somewhere that was still open and where we knew something of the menu – McDonalds. This was actually an interesting experience. One of the main problems was that the menu was still in English, but pronouncing it in English was useless, you had to try and pronounce the English words (e.g. “fruit & yoghurt”) with French pronunciation. 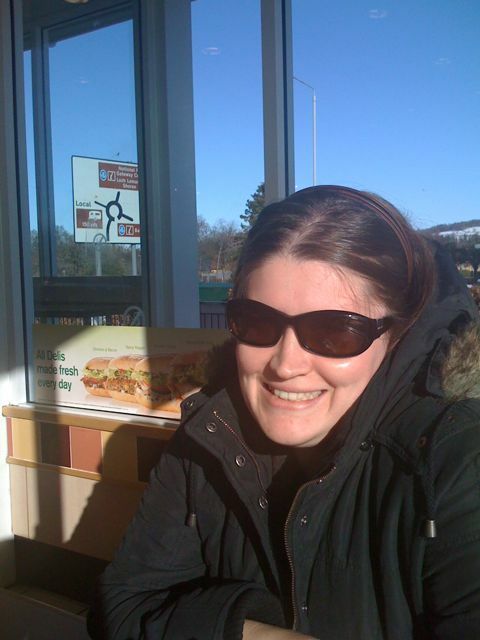 Apart from the ordering experience, it was almost exactly like eating at a McDonalds at home – a very mixed blessing. Hurry back, plenty to tell you about our last day in France and our first day in Spain. When I last left you, we were aboard a bus heading for Grenoble, or as my old mate Dan calls it, G-town. Shortly after the bus deposited us in G-Town, Dan arrived with his fiancee to pick us up and take us up to his place. 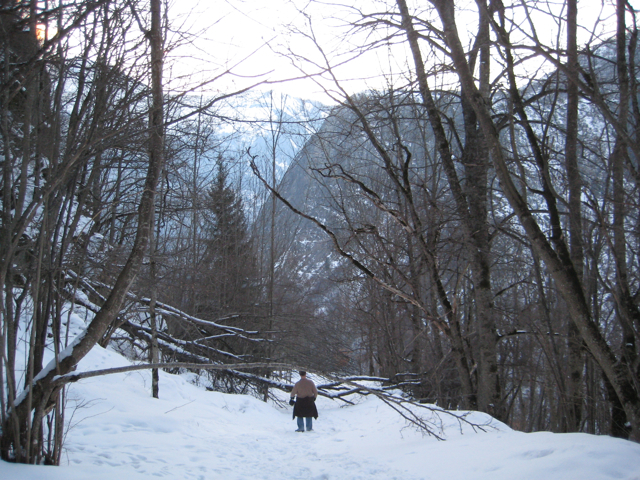 Dan lives and works at a camp centre in the French Alps, not far from Bourg d’Oisans (which, an English speaker can easily approximate as “Board was on”, thanks Dan!). The next morning, Dan headed off to do his duties. Anna and I felt that we need a little holiday from our holiday and took it easy. I polished off a Harry Potter novel that I had started in Monmouth, fortunately there was a copy at Dan’s place. By mid-afternoon, feeling that our bones had been sufficiently lazy we put on our cold weather gear and went out for a walk in the snow. Unlike the snow we had seen on the footpaths of London, this was serious snow, steep and deep and smooth. After we had exhausted ourselves we headed back, satisfied that the day had not gone to waste. The following day Dan had managed to slip away from his duties and he, Candine, Anna and I took a drive up to the ski lifts and from there took a ski lift up to a ski resort. This was a great deal of fun. I have never been to ski fields before so everything from the winding mountain roads, (Dan would sound the horn before driving around a bend in case there was oncoming traffic) to the ski lifts to small-town feel of the ski resort was like nothing I had previously experienced. 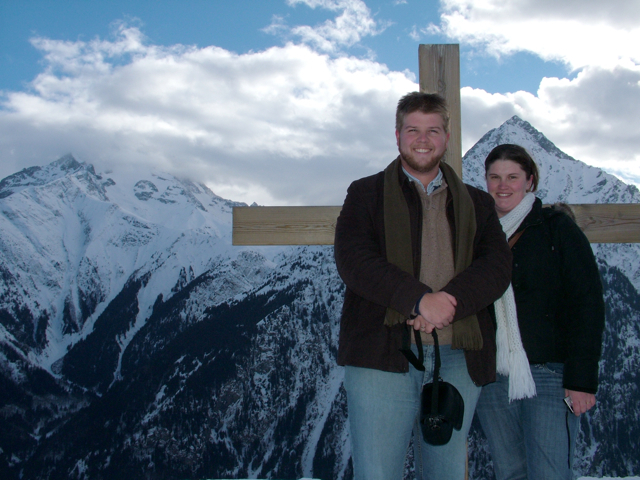 We walked through the resort to a wooden cross on the edge of a cliff. 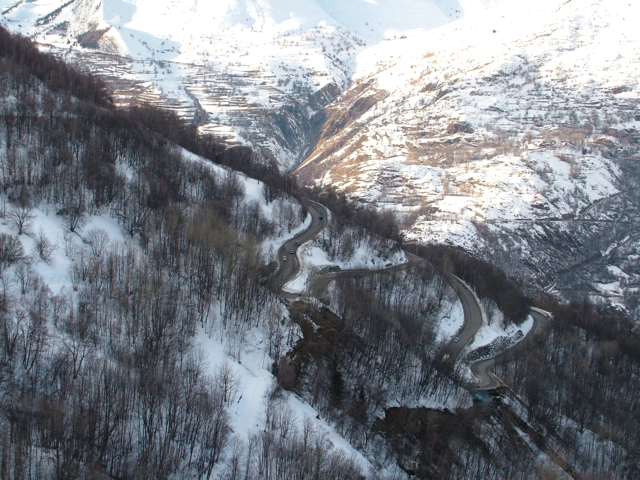 From there we could see up 1500 metres to the top of the slopes. On the walk back through town I asked Dan what the point of “snow shoes” was (we had seen snow shoe tracks on our walk the day before). He pointed to the soft snow either side of the track and said that with with snow shoes you could walk on the soft snow, without them you would probably sink to your waist in the snow. I had to give it go. 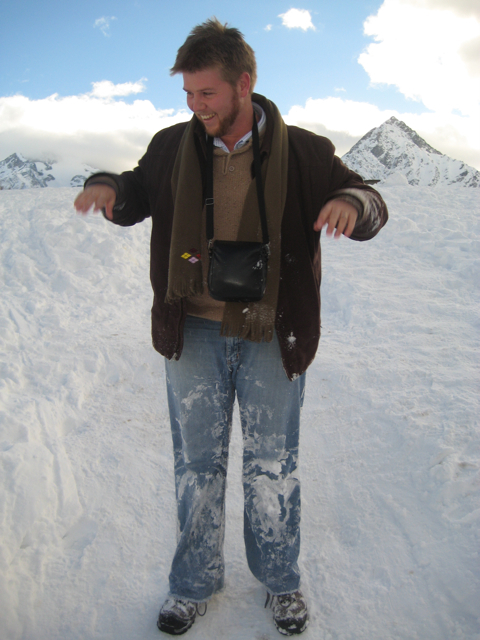 I sunk to my waist in snow. I sunk in the soft snow. I had been warned. 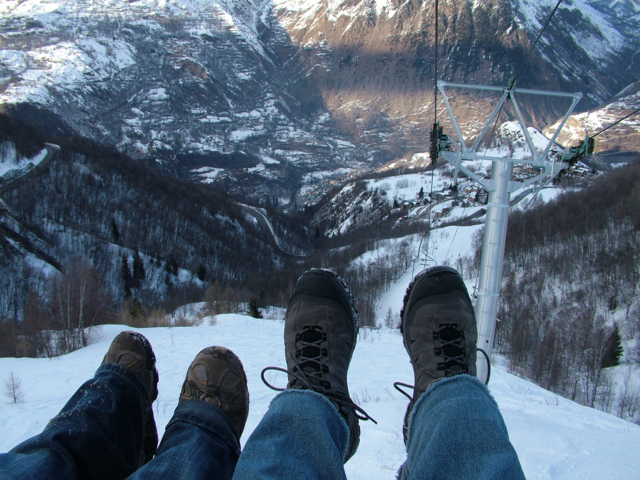 Our stout walking shoes on the ski lift. That night we sampled a local liqueur made from Berries grown at 2000 feet or higher. I can’t remember what they are called, but as always, I enjoyed trying something new. Afterwards we watched the movie “Mission Cleopatra”, an Asterix and Obelix film based on the comics. The film was in French only, so we had to rely on our memory of the comic and Dan and Candide’s patient pausing-and-explaining. This was an awesome film! I can’t beilieve I haven’t heard of it before. The next day it was time for us to go. 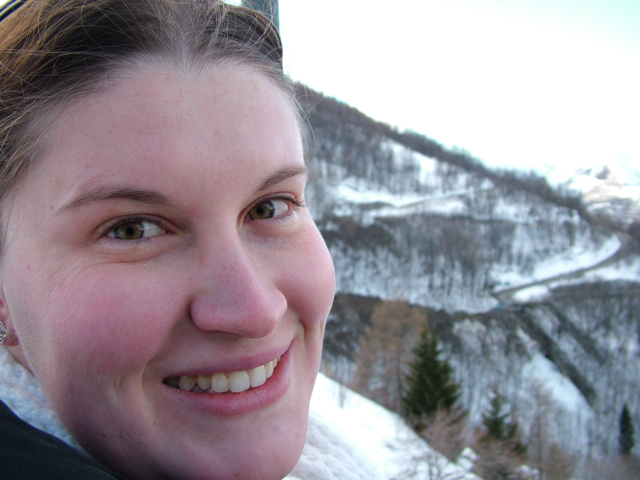 We bade Dan farewell and caught the bus into Grenoble, then the high-speed train into Paris and the Metro to our hotel. Speaking as a connoisseur of Australia’s Countrylink and Sydney’s City Rail, France certainly know how to do trains. The high-speed train was smooth and comfortable (it even had a powerpoint so our laptop stayed fully charged while we watched Top Gear DVDs), apparently reaching 200km/h. The Metro (Pasis’s equivalent to London’s underground) was also fast and easy to use). We managed to find a Casino not far from our hotel and spent a bit of money there, stocking up on the essentials (Casino is a supermarket chain in France). We had a simple tea of baguettes and fromage and headed off to bed. Our first glimpse of the Eiffel Tower. 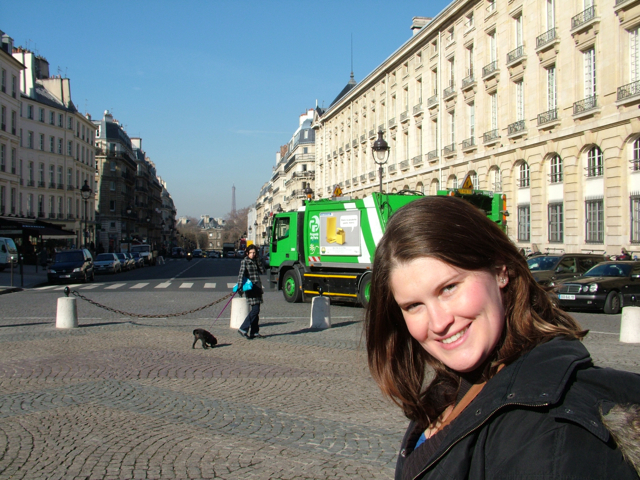 Day two in Paris: We started out walking from our hotel to the nearby Pantheon. From there we continued into the city, meandering about until we stumbled into a metal pointy structure we both instantly recognised at the Eiffel Tower. We marvelled at this for bit and then climbed aboard our open-topped bus tour. This took us back around the tower, back past the Églişe du Dome, the Musée Rodin and the Hôtel des Invalideś all the way to the Notre Dame Cathedral. At the cathedral we hopped off and admired the amazing building. 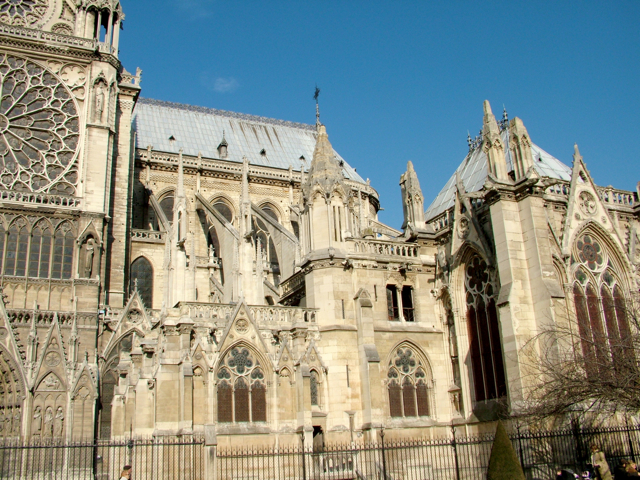 Apparently the cathedral is a good example of French Gothic architecture. If by that they mean extremely impressive, highly ornate and adorned with beautiful arches, gargoyles and flying buttresses then I’d have to agree. On the inside there was no shortage of impressive stained glass, interesting alcoves and dizzyingly high ceilings. Being shoulder to shoulder with our fellow tourists, listening to chatter of hundreds of other visitors and the snapping of dozens of digital cameras made the setting feel more like a tourist attraction and less like a place of worship – this placed Notre Dame in stark contrast to other churches we visited such as the Abbey in Bath or St Paul’s Cathedral in London where there was still a sense of serenity and peace. Outside we joined the queue to climb to the top of the cathedral, but after five minutes the line, stretching half the length of the cathedral, had not moved and our hungry bellies and itching desire to experience more than one of Paris’s landmarks inspired us to abandon our posts. 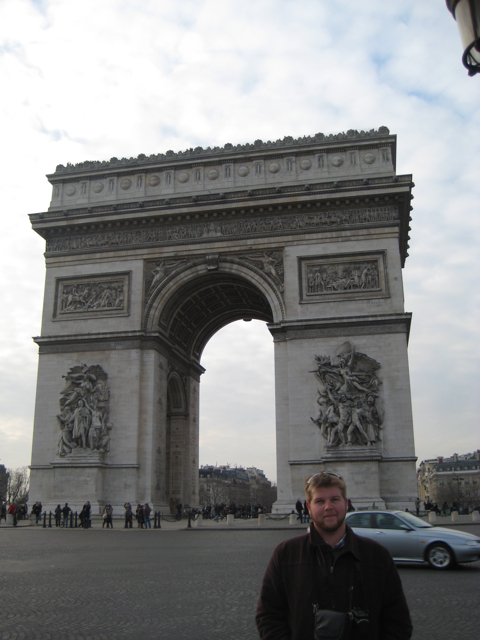 We climbed back onto the bus and headed up the Champs-Élysées to the Arc de Triomphe. Now I don’t pretend to be an expert on French history (it was hard enough pretending to be an expert on British history) but from what I gathered, the arc was commissioned by Napoleon in 1806 as a monument to the various triumphs that he and his troops had had about the place. Unfortunately at that point in history French Kings, Emperors and Presidents didn’t seem to last too long and Napoleon died before it was finished. Anna and I climbed the approximately 10 billion steps to the top and enjoyed an amazing view of Paris. 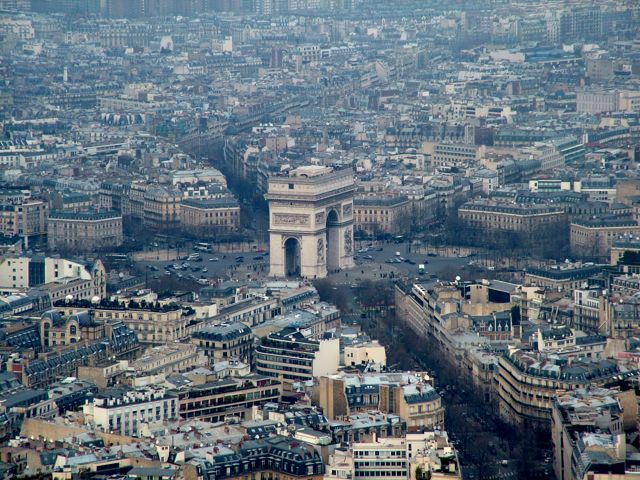 Looking straight down we could see the Place de l’Étoile, the square on which the Arc de Triomphe is built. 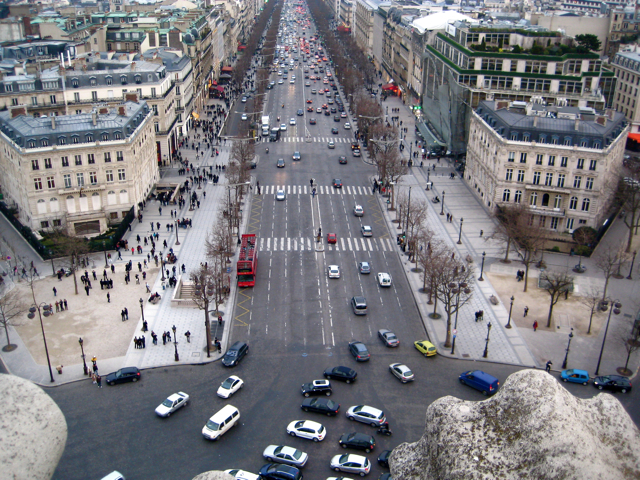 It is an enormous roundabout onto twelve different streets when basically anything goes. The bus tour, nearing the end of its day, deposited us back near the Eiffel Tower where we sat and watched the tower lights come on as it got dark. We caught the tower’s light show, which occurs on the hour and lasts about five minutes – strobe lights suddenly light up the tower like a disco Christmas tree. Finally we Metro’ed back to our hotel. 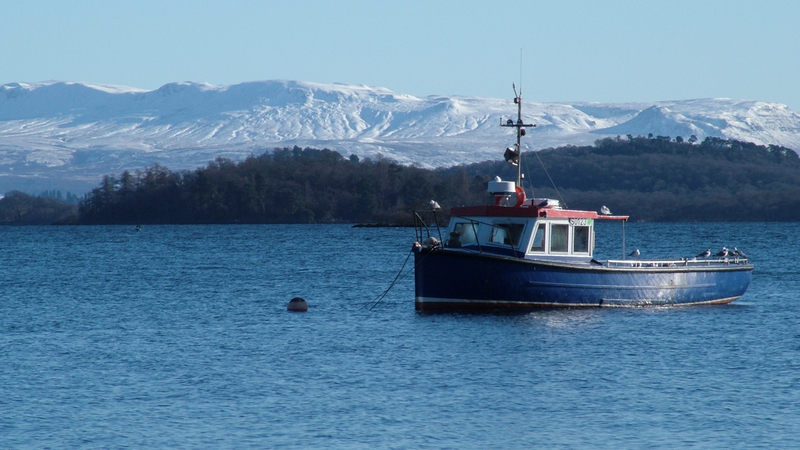 We had a lovely drive around Loch Lomond. We kept an eye out for Nessie but didn’t get to see her, party because very few tourists ever do, party because she is said to live in Loch Ness, not Loch Lomond. Loch Lomond what very picturesque. Anna explained it best when she said it was like being on the lid of a jigsaw puzzle. After a fairly long drive right around Loch Lomond, we wound our way to Edinburgh. We checked into a B&B in Tranent, just out of the city. We went across the road for a pub dinner. They had Haggis on the menu, so I decided to give it a try (only brave enough to order it as a starter). It was no bad at all, quite like a spicy sausage, with just a hint of offal texture. The next morning I was up at around 4am and saw the first few snowflakes fall. I went back to bed but the snowflakes didn’t. By 9am we were crunching through a couple of inches of snow towards the bus stop. We caught the bus into the city, through even more falling snow. We started an open-topped bus tour of the city (sitting downstairs this time). 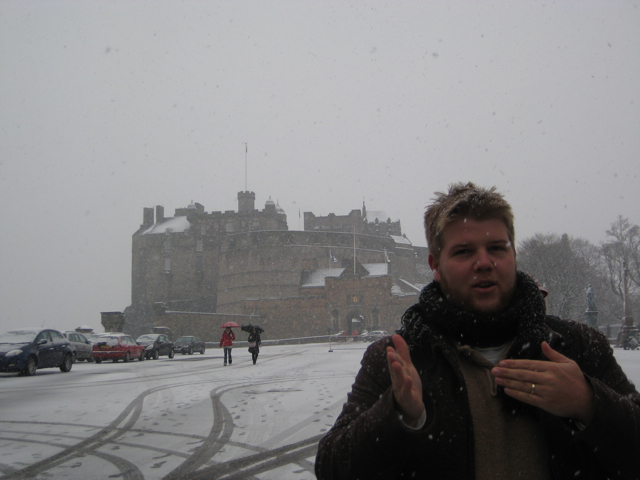 We got off at the castle, but sadly the castle had been closed due to the weather. We walked through a tartan mill and managed to avoid the temptation to purchase a kilt or pose for a photograph in full highland regalia. After that the castle was still closed. 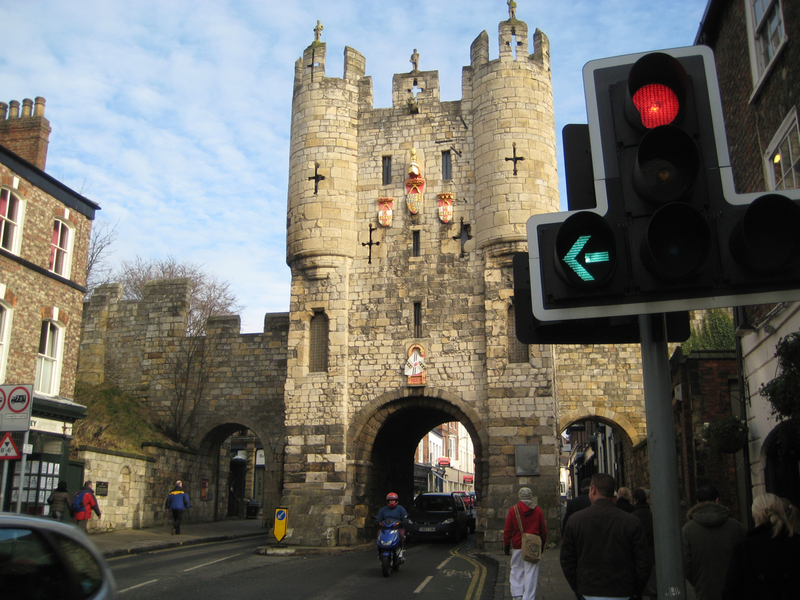 We considered taking it by force, but history has shown it to be fairly impenetrable, so we had a spot of lunch instead. Finally, after lunch the castle had been reopened. We spent a couple of hours wandering around the rooms and displays. 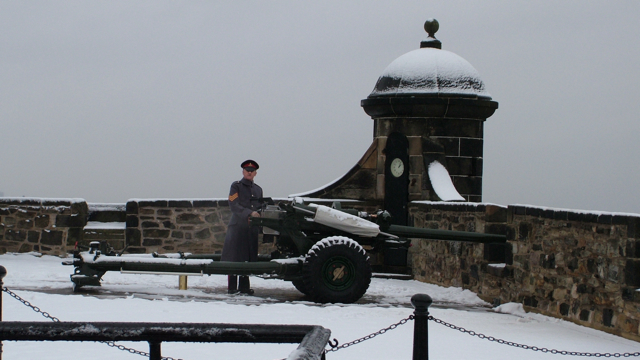 At one o’clock they fire the “one o’clock gun”. It was quite a large gun, more like what I’d call a cannon. They fire it at 1pm so that ships at sea could adjust their chronometers. Apparently it can be heard at Leith Harbour, more than 3km away. I can certainly report that at a distance of about twenty metres with absolutely no warning, it is audible. 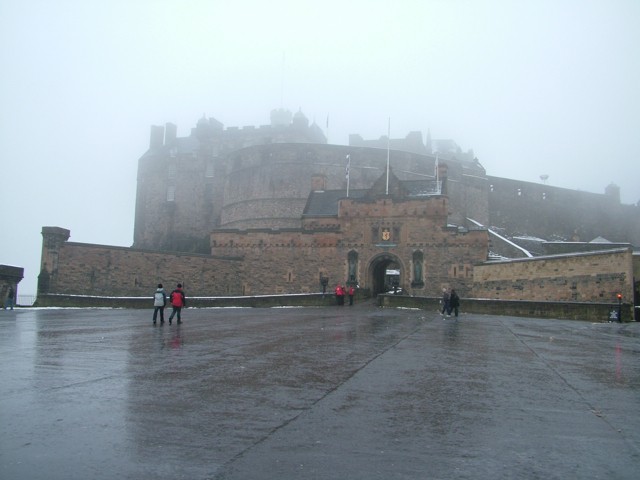 The Edinburgh castle also houses the Scottish Honours, or the Scottish crown jewels. These are the original crown, sword and sceptre of the Scottish royalty. Dating from the coronation of Mary, Queen of Scots in 1543, they are the oldest crown jewels in the UK, and the second oldest in Europe. There is an amazing story of how they were smuggled out of the castle to avoid caputre by Oliver Cromwell during the English civil war and buried in a parish church. Years later, after the union of the English and Scottish crowns and parliaments, the Honours were placed in a oak chest and sealed up in a room of the castle for 111 years. In 1818 a few Scots were wondering what could have happened to them, so they dug them out again and put them on display. Equally as interesting is the Stone of Destiny, or the Stone of Scone, also on display in the castle. However, as time is running out, I shall leave it up to Wikipedia to tell you about it. We finished our bus tour of Edinburgh, passing by plenty that we would have liked to get out and explore if time were on our side, including the old and new houses of parliament at Holyrood. All in all Scotland was fantastic, hope we get to come back some day. Back in our car we followed the coast down to Whitley Bay. We’re about to explore the beach a bit to see just how the North Sea measures up to the Pacific Ocean. Then we’ll have a poke through their Newcastle, and finally leg it for York. This is our third last day in the UK, so making the most of it. Okay so, scamming some more McDonalds wifi, but this time the MacBook battery is flat, so I’m pecking out some notes from my iPhone. We just stayed two nights in the most beautiful B&B. It was a gorgeous country house in a village called Fintry, half way between Glasgow and Loch Lomond (pronounced with emphasis on the “Lo”). Our hostess Meg was a wonderful Scottish lady who was extremely helpful and accompdating. Yesterday we checked out the Glengoyne Distillery, alledgedly the most beautiful distillary in Scotland After a fasconating tour we sampled some of the 17 year Whisky. Very nice on a cold morning. Next we saw Glasgow, doing a open-topped bus tour and visiting the incredible Transport Museum. Today we are seeing the Loch. Oh dear, just saw a chap in a suit take a nasty stack on the ice outside. A more serious version of Anna’s graceful tumble on our way in, after watching me have a little slip too. Turns out ice can be dangerous. Who knew? Anyways, great to hear everyone’s feedback (hint hint). We’re having a great time. See you all soonish. We headed towards Monmouth and got as far as Bristol before I remembered that we weren’t staying in Monmouth that night. We turned around and headed to Oxford. 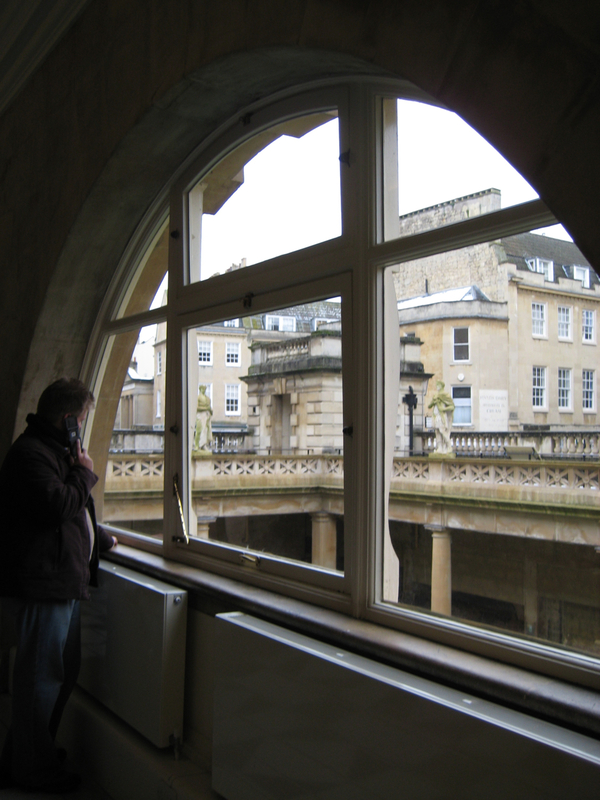 Spent the morning in Oxford, which had a lot of old buildings. The colleges weren’t generally open to the pubic. Enjoyed a delicious English meat pie for lunch. Headed to Monmouth, Wales. Unfortunately there wasn’t a great deal to do in Monmouth, being Sunday. We had dinner in a pub on Saturday night, mainly just to overhear some terrific Welsh accents. The girl at the bar couldn’t undersatnd my order, “Two Irish Stews”, thinking I had said “The Irish Juice”. I guess the accent thing goes two ways. Left Monmouth for a small region of Lancashire called Anglezarke, which is apparently where the Anlezarks come from. 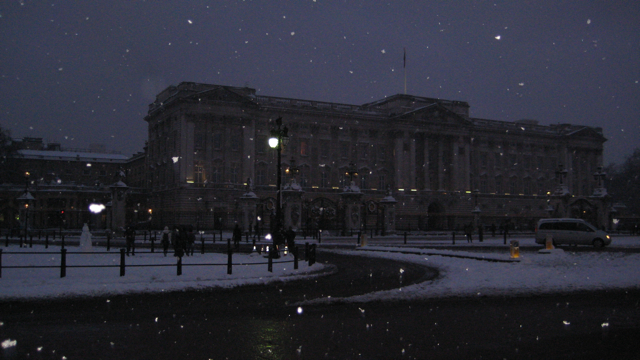 It was snowing fairly heavily when we got there. I guess the region was glad to see two of its own. Left Monmouth for Carlisle. Arrived quite late and enjoyed a sandwich in our B&B. At 10pm I had a job interview over the phone, which was quite a challenge. The call cut out 3 or 4 times. I’ll hear about that next week. Explored Carlisle this morning. Carlisle Castle was quite amazing. They have a military museum based with the 12th century walls. Quite fascinating. 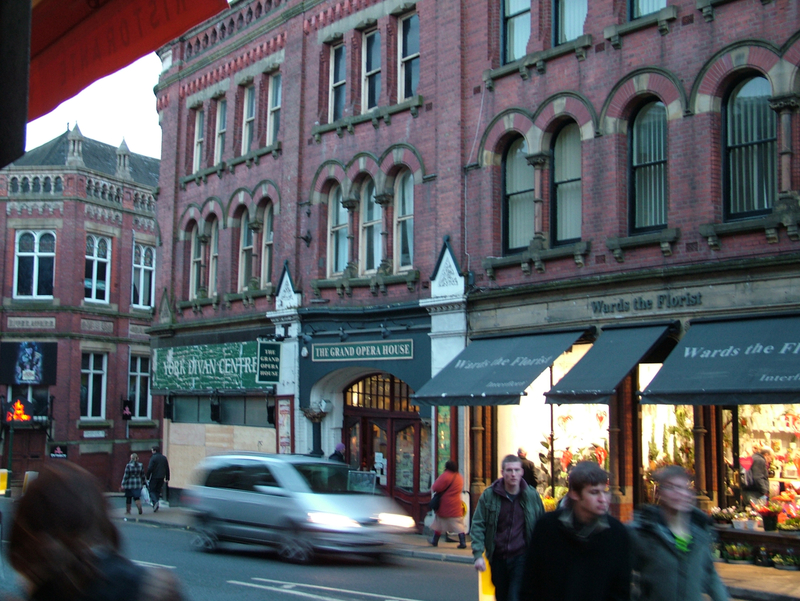 Carlisle was an important city for the various English-Scottish conflicts over the years and has had a military presence from the 12th century until the 20th century. We are currently scabbing free Wi-fi from Carlisle Maccas, having purchased a small diet Coke for 89p about three quarters of an hour ago. Perhaps we’ll have an early tea here.